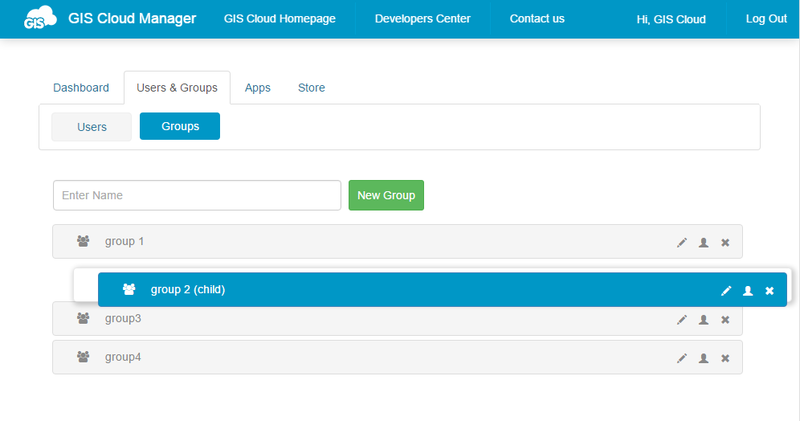 Groups feature in GIS Cloud Manager and Map Editor is used for simplifying the process of creating, managing and editing custom user groups. Groups feature enables different types of user grouping, so that groups of users can be assigned with different set of permissions depending on a designated group. 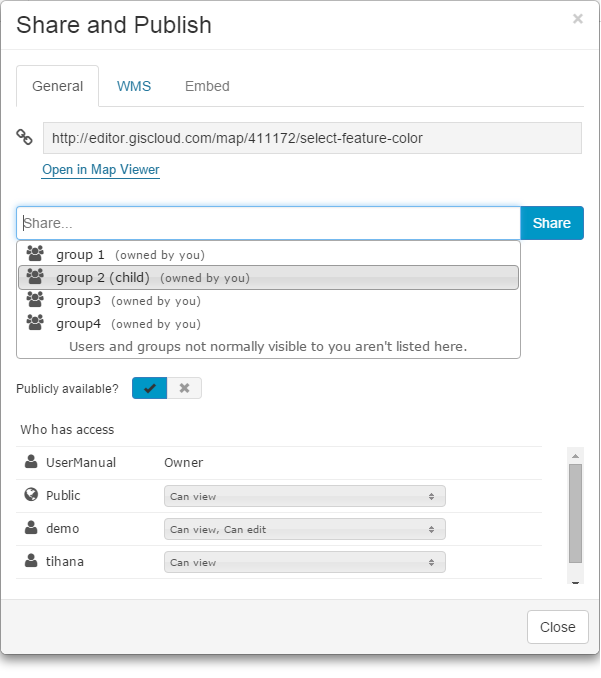 Groups can be created and managed in GIS Cloud Manager and they serve as a way for managing user permissions in Map Editor. 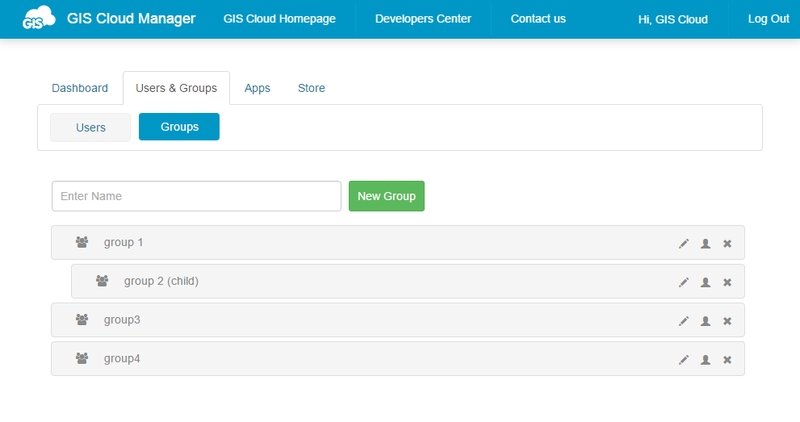 In the GIS Cloud Manager app, under the Users & Groups tab click Groups button. Enter the group name and click Create button. Next step is adding members to the group. Click on the Users icon. Write username and click Add button. Note: you can add users that are not part of your organization too. It’s possible to create subgroups with different permission levels. To create a subgroup, drag&drop existing group under the parent group. Note that parent group will inherit all permissions assigned to the child group. In the GIS Cloud you can share maps and layers with different permissions. E.g. map is shared with view permission, and one of the layers is shared with edit permission. Permissions can be assigned in the Map Editor, Mobile Data Collection Portal or Maplim. Can view – user can only view shared map or layer, without permission to edit or export. Can edit – user can view and edit shared map or layer, e.g. edit attributes, geometry or update layer symbology. Can export – if map is shared with export permission, user will be able to export all layers in a map. If only certain layer is shared with user, he will be able to export only layers with granted permission. Can collect – if map or layer is shared with Collect permission, user will be able to only review old data and collect new data. Can update – if map or layer is shared with Update permission, user will be able to only review and update old data, not collect new data. Here can be found more about Sharing process and Permissions. Note: if you get “You have 0/0 Mobile data collection subscription(s) in total available. Please go to the Manager app to manage your subscriptions” then you have to purchase MDC licenses and assign licenses to yoursef in the Manager app.